The first step should always be to make a complaint to the respective entity. Entities are required to set up certain processes for the processing of complaints. In such cases, certain key points must always be observed. It is therefore recommended to submit a complaint in writing to the entity concerned. Such complaints may also be addressed to the senior management of an organisation. to communicate in clear and easy to understand language, to give a response within an appropriate timeframe, to communicate when the procedure will be concluded, and in the case of notification of a final decision having been made that does not address the demands placed by the party lodging the complaint, to justify the decision and to inform the party lodging the complaint about further options and points of contact. If the event that you were unable to reach an agreement with the organisation through their complaints procedure, and your request was rejected, then you may turn to the FMA. In addition to the complaint submitted to the FMA, please also submit the written statement that you have received from the organisation against the complaint that you made. Complaints are an important source of information for the FMA’s supervisory, investigatory and inspection activities. Complaints are a useful source of information for the FMA to check whether a supervised entity behaves in a legally correct way towards its customers as well as whether shortcomings exist in the entity, against which the FMA can act by using supervisory measures. The FMA takes every complaint made against a supervised entity seriously, and follows up each individual piece of information received. The FMA is not, however, a board of arbitration and is not able to take a binding decision in relation to individual disputes. This remains the sole responsibility of ordinary courts. Only orderly courts are able to resolve contrasting legal views in a binding manner and to compel the entities e.g. to pay compensation by application of a verdict. We check whether we are able to already adjudicate in your case on the basis of the details that you have provided, and the documentation that you have submitted, in particular the complaint that you have submitted as well as the submitted statement that rejects your complaint in writing, which you received from the organisation. In order to give the company against whom the complaint has been made an opportunity to respond to the allegations, we request them to make a statement. The company reports to us in detail and explains the reasons for its decision and submits the relevant documentation. In the event that our checks reveal that the company’s decision is not legally contestable, then we will inform you that this is the case. In the event that there are indications that there has been a supervisory breach, we take further supervisory steps and measures, which may also lead to an administrative penal proceeding being conducted. The subsequence process is subject to official secrecy. The bodies and employees of the FMA are obliged to maintain professional secrecy in accordance with the Federal Constitutional Act as well as the FMABG (Federal Act on the Establishment and Organisation of the FMA). This means that the bodies and employees of the FMA are obliged, under certain legal circumstances, to maintain professional secrecy with regard to all facts that they have become aware of exclusively as a result of their operational activities. We therefore request your understanding that we are unable to provide you with any more precise information about entities supervised by the FMA (e.g. information about their solvency, or ongoing legal procedures etc.). The contribution of the supervisory authority towards consumer protections takes on the forms of solvency supervision, market supervision and conduct supervision. 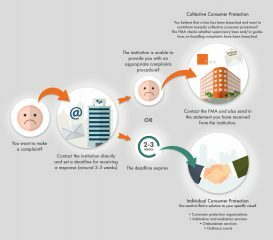 Collective consumer protection is an important objective for the FMA. This means that the FMA protects consumers in their collective entirety. The FMA, however, is not a consumer protection organisation in its classical sense, i.e. one that is able to provide assistance for parties seeking redress as they strive to assert their demands or damage claims against a supervised entity. The FMA is therefore unable to offer protection to individual consumers. As a supervisory authority the FMA is expected to retain an objective stance towards all supervised entities and their customers, and is never allowed to take sides. Any claims for damage by consumers who have suffered losses should always be made by means of legal action through civil courts. We are available to answer your enquiries from Monday to Friday between 9:00 and 16:00.
domestic and cross-border credit transfers (within the EU), deposits and withdrawals from a current account, as well as all processes related to holding such an account, use of credit cards, debit cards etc. “Schlichtung für Verbrauchergeschäfte” is the competent organisation for all consumer transactions as defined in Article 1 of the Consumer Protection Act (Konsumentenschutzgesetz). It does not, however, cover patient rights, rental contracts for apartments and houses, or cross-border consumer transactions. It cooperates closely with other existing ombudsman services (Telekom-Control, E-Control, Schienen-Control, Poststreitschlichtung, Internetombudsmann and Bankenombudsmann). The Verbraucherschlichtung is also competent as a fallback ombudsman for loans denominated in foreign currencies. in the case of disputes between brokers and insurers. clarifies where there is a dispute about factual elements, who is required to prove what. It is the ombudsman for customers of companies in the financial services sector. In the event that irregularities occur, all customers of financial service providers in Austria have the option to contact the ombudsman. The ombudsman’s main task, is to point out any errors or misunderstandings that have occurred when being given financial advice, to explain to customers what has happened, and to draw up suggested solutions together with the financial service providers. The Ombudsmann des Fachverbands Finanzdienstleister can be reached by telephone on +43(0)5 90 900-5550 or by e-mail at fdl.ombudsstelle@wko.at. The Beschwerdestelle über Versicherungsvermittler (for lodging a complaint against insurance intermediaries) is housed in the Federal Ministry of Science, Research and Economy (Bundesministerium für Wissenschaft, Forschung und Wirtschaft). Pursuant to Article 365 no. 1 of the Commercial Code (GewO – Gewerbeordnung) it is required to deal with complaints about insurance intermediaries from customers and other affected parties, in particular consumer protection organisations free of charge. The FMA’s complaints department should also be notified by the Beschwerdestelle über Versicherungsvermittler about complaints against credit institutions and insurance undertakings as insurance intermediaries. It cooperates with comparable organisations in other Member States to settle cross-border disputes, and promotes cross-border cooperation with other complaints bodies and ombudsmen. Affected parties may contact the Datenschutzbehörde (Data Protection Authority) if their rights have been breached of if a contracting party or service provider has breached its obligations in accordance with the Data Protection Act of 2000 (DSG 2000). Different procedures exist depending on the nature of the complaint. Opening hours: If you require an appointment in relation to the procedure, please contact your case officer. The VKI offers advice and assistance on consumer issues across all areas: Complaints relating to goods and services, contracts concluded in an overly-hasty manner, excessively high bills, problems with workmen and when travelling, in the case of problems with insurance companies and banks as well as issues relating to housing law. It is also possible to arrange personal appointments to receive advice. In addition for legal advice relating to civil law, it is also worth considering the weekly advice sessions (Amtstage) at the district courts. During these advice sessions it is possible to request legal information free of charge.